My Story is a series of blogs about the real people (and their dogs!) behind canicross. 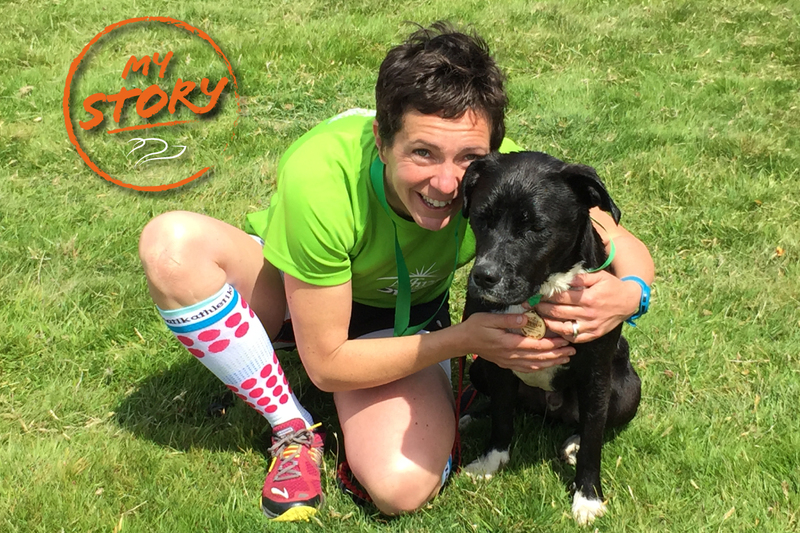 Every person has a story to tell; about how they discovered canicross and how much it means to them personally. Unsurprisingly, it’s not just about getting fit. It goes much deeper than that. 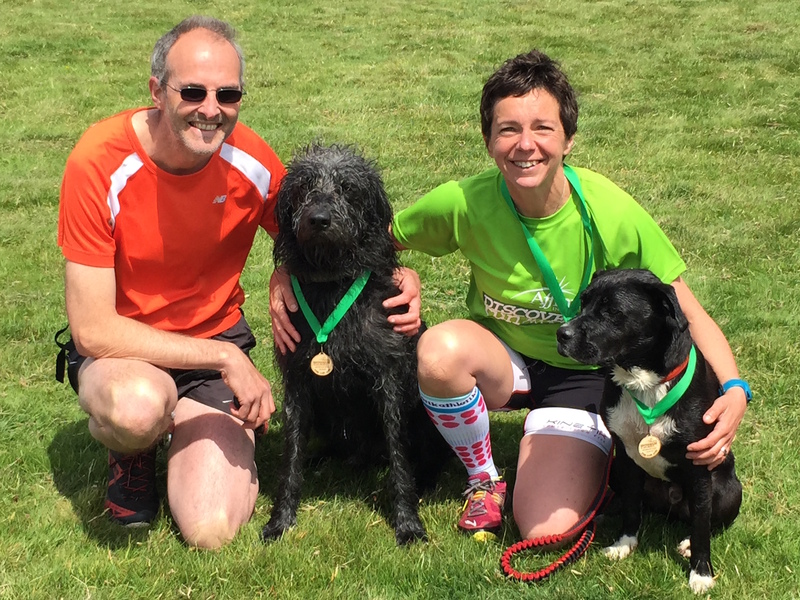 Like Juliet who shared her story about how canicross helped her through a particularly difficult period in her life and Ginetta, a non-runner at the time, who was converted as a result of wanting to share in a sport with her GSP Coco. So, what was the Hammon household like before Enzo came along? I have always been a sports person, and tried just about every sport. In our pre-dog life, my husband and I spent our weekends cycling, running and hill walking, and our holidays windsurfing, kayaking or sailing. When we decided to have a puppy, I wanted a dog that would be happy to come along to our every adventure! We got Sprocket (a large Labradoodle) at 8 weeks old, trained him, socialised him etc. but I just couldn’t wait for him to be old enough to start running. We started when he was 15 months old, and he came on runs, bike rides, camping holidays, swam in the ocean, came kayaking with us, and even relaxed in the hammock! We also took up agility with great success, and it’s been his sport ever since. How did you first discover canicross? Submerged in the canine world, I read about canicross one day and my first thought was that it was crazy! Yet so tempting! I joined a local social group of canicrossers and spent a few months reading their stories and looking at their pictures, very envious but not feeling brave enough to take the plunge. I think it was the New Year resolutions that did it, bite the bullet and all that, and we actually joined them on one of their beginners runs. As they say, ‘the rest is history’. I was hooked! What fun! That same afternoon I ordered some kit for us and Sprocket and we have been running with this group every weekend since. So what led you to getting another dog, and specifically Enzo? I had personally wanted another dog for some time but my husband wasn’t convinced yet. Having to share a dog for canicross every weekend soon sealed the deal though! This time, more experienced, we decided to look for a rescue dog though as it breaks my heart to see so many in need of a home. As before, we looked for a breed that would fit our lifestyle plus have potential for both agility and canicross. 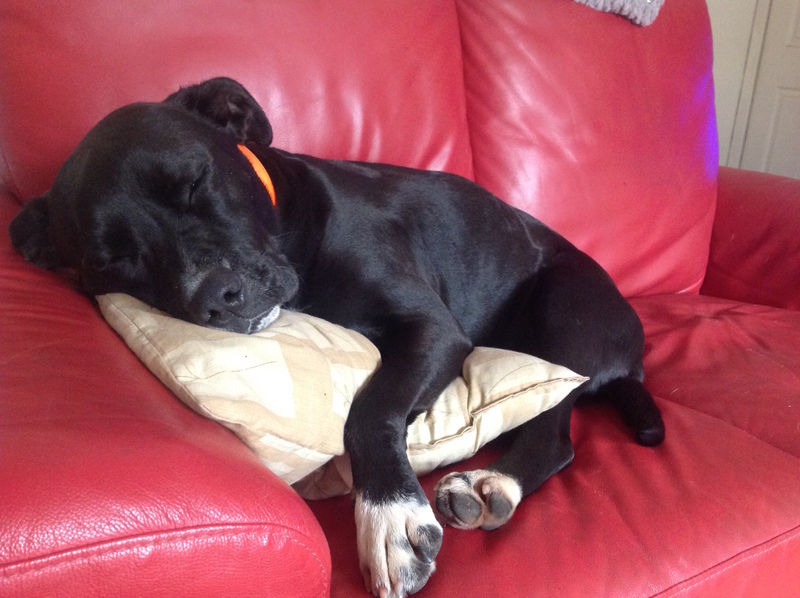 If I’m brutally honest, I had never looked at Staffies before meeting with fellow canicrossers. Never really thought about them. But after meeting quite a few on our first runs I soon realised what wonderful companions they make and how brilliant they are at canicross. And one day, as if it was meant to be, our agility teacher found an 18 month old rescue Staffie x Border Collie in need of a home. This mix got my attention straight away (staffie = pulling power, collie = endurance and agility!). l got in touch with the kennels, found out about his history, went to see him, introduced him to Sprocket (they got on fine) and he came straight home with us. Tell me a bit more about Enzo – what’s he like and how did he take to canicross? We named him Enzo as I couldn’t help thinking he looked like a little hunk when we first met him, so a macho Italian name was quite fitting! He is very playful and very gentle natured. He loves the company of other dogs and people too. Poor little thing found himself in kennels through no fault of his own, just marriage break up, and spent 5 months in kennels. Unfortunately, I don’t think he had received much training in his previous life and had very little exercise during the months in kennels. He was very hyper and had no rules when he came to us and always at 150mph! Zebedee springs to mind! The day after he came home, I put him in a harness to try a little run. The boy was a natural! Pulled like a steam train and loads of energy. He was unbelievable! I knew this was gonna work for him! He loved it. But walks were a nightmare for a while. 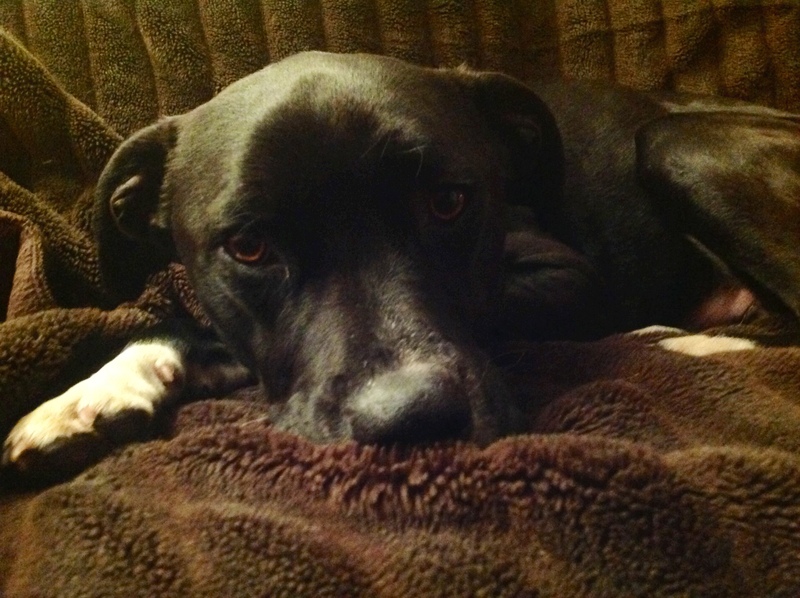 He pulled your arm off whilst on the lead and ran off into the sunset off the lead. So for a few weeks we ran a lot!!! Canicross was a life saver. He was able to safely get rid of his pent up energy from months in kennels and it stimulated him by giving him a job to do. With Canicross and a lot of recall work, it took 3 months for Enzo to become a calm, well balanced happy little chap who can walk on and off lead anywhere. He has truly turned into an amazing and wonderful little pet! He is extremely cuddly and loving. He loves nothing more than cuddling with me on the sofa! He is very cheeky too but endearing with it. Always has his tail wagging. But beware! Behind this oh so cute little face lies a thief!!! He is extremely greedy and food often goes missing round here! And what impact has canicross had on all of your lives ? Team Hammon grew from 3 to 4! One dog each for runs = no fighting! I really feel we have quite a nice little family now, all different in characters and skills. Canicross is a big part of our lives. We meet up with fellow canicrossers every weekend and it does feel wrong if for whatever reason we can’t make it. It’s very addictive, very sociable, and it sets us up for a great weekend. It’s time we spend together doing something we really enjoy, it’s simple but very special. 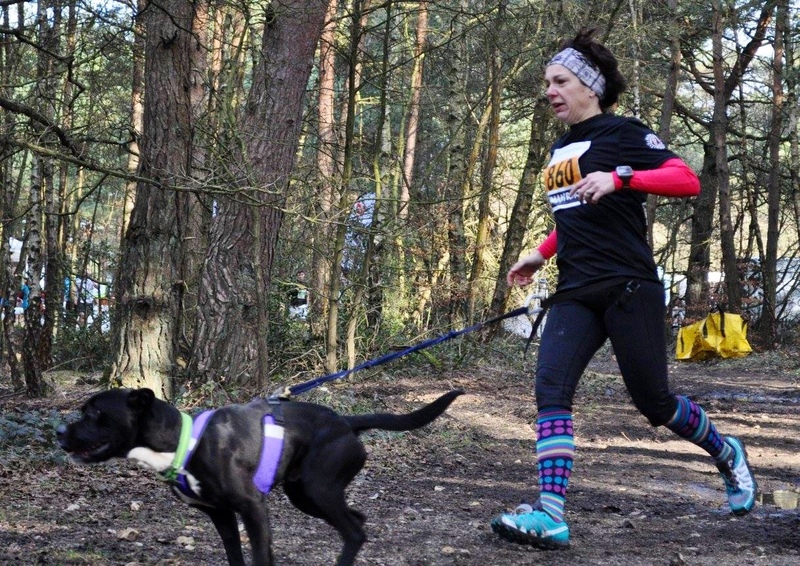 What would you say to someone who enjoys keeping fit and is contemplating trying canicross with their dog? I can’t think of anything better to do to get fit and develop a bond with your dog! It’s brilliant fun and very motivating. Plus, it’s time efficient. You get to take the dogs out and you get a workout! My dogs get me out and get me fit! Sometimes (not often but occasionally) I don’t feel like doing much, so they take me out for a run, it lifts my spirit..,they’re happy, I’m happy and we all get some exercise! Everyone is a winner! 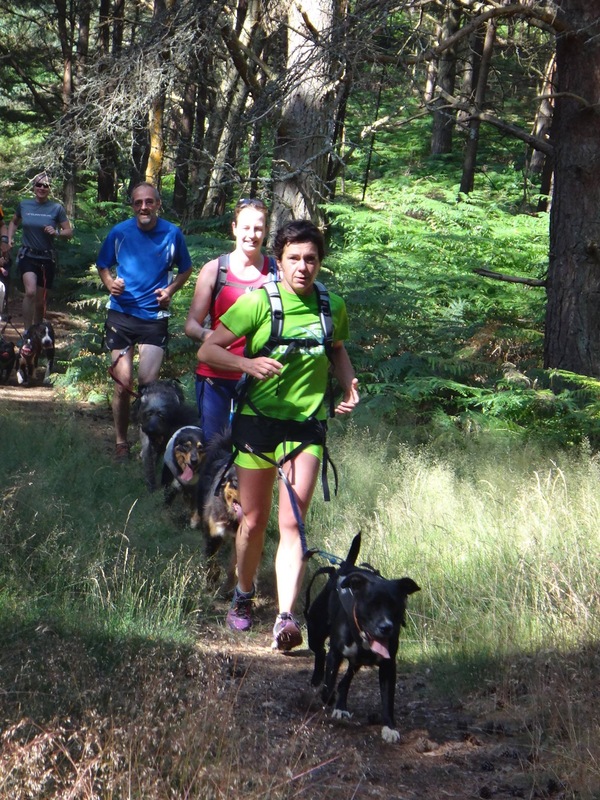 What, in your mind, makes canicross such a good outlet for rescue dogs? 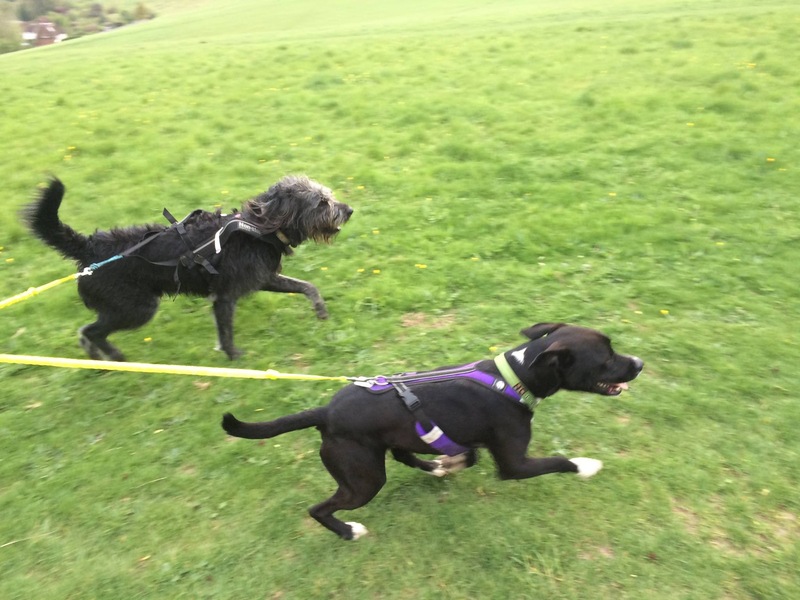 If your dog is a rescue dog, he will most likely have pent up energy and will need to create a bond with you, canicross is a perfect tool for this. It’s safe exercise, it’s a job for the dog to do, it’s socialisation, it’s stimulation, it’s bonding and it’s fun! It has literally saved Enzo’s life and massively enriched ours.